"At one of the early gigs I remember going to The Smiths were supporting The Sisters of Mercy at The Brixton Ace - which to this day I still can’t make sense of - but me and Emma were massive Sisters of Mercy fans. The first time we travelled outside of London to go to gigs was seeing The Sisters and we got up to all sorts. “I went to see them in Leeds and I stayed at James Brown’s house, the guy who ended up doing Loaded magazine. He was quite sneery about them and said “Why are you seeing this f**king band?” I had a relationship with this guy who was at Leeds Poly at the same time as Andrew Eldritch and he f**king hated him! He hated the fact I liked The Sisters. I used to put their records on to wind him up and he’d go ‘This is just s**t’, he thought it was hilarious. “Like with The Shangri-Las, there was a real theatre to The Sisters - there was dry ice and Andrew Eldritch with his baritone, looming through the darkness with his Sandeman hat on. It was totally over the top, even with the people in the crowd and the way they’d throw their arms up towards heaven, it was brilliant. We used to travel the length and breadth of the country to see them and it was worth every night in a s**t police station. Yes, The Smiths paired with The Sisters doesn't make much sense but apparently Johnny Marr and Eldritch got along very well (see my post earlier in this thread). Lush is another one of my favorites and I have nearly everything by them. Andrew Eldritch is the great forgotten lyricist of his generation. “Dominion/Mother Russia” was a rumination on the apocalypse and also a critique of efforts to meaningfully engage with the Soviet Union at the height of the Cold War. Ever better, and from the same Floodlands album was “This Corrosion” – a track more epic than watching all three Lord of the Rings movies from the top of Mount Everest. Amid the choirs and the primordial guitars, what gives the nine-minute belter its real power are the lyrics – which may (or may not) allude to the not-at-all amicable departure from the Sisters of That Guitarist and Craig Adams. Either way, Eldritch paints forceful pictures in the listener’s head, especially during the stream of consciousness outro, unspooling like an excerpt from HP Lovecraft’s The Necronomicon or the Book of Revelations: The Musical. but I can't insert it inline without it appearing the size of Trump's ego and taking this whole thread over. Haircut was before the US dates, wasn't it? He looks like Ian Astbury. 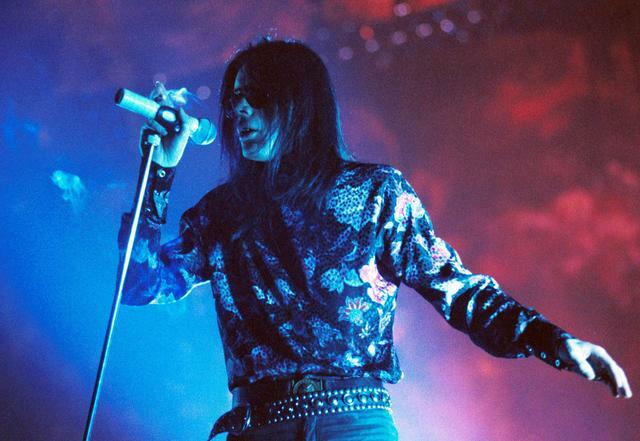 "I’ve seen Andrew Eldritch in an ice hockey shirt onstage, and I’ve given him the benefit of the doubt"
A touch of the Bobby Gillespie's going on too. 'On arriving at the venue we pulled into the parking area, where the only other vehicle present was a shiny black van with heavily tinted that wouldn't have looked out of place in an episode of Scooby Doo. We drew alongside it and began gathering our bags and jackets, when the side of the black van slid open. In my imagination I heard a whoosh of air and saw a cloud of dry ice emerge from the interior, but instead a mad-haired, lanky figure, dressed completely from head to foot in black, emerged from the van and slowly encircled our bus. The door of the black van was still open and I could see that the interior had been carpeted in what looked like black sheepskin. As the shadowy figure continued his inspection, we remained in our seats and watched him. Having now completely circled the van, he approached the driver's side and Tony rolled down the window. "Nice van, man," said the figure. The credibility of this account can be questioned by his description of Andrew as 'lanky'. But it's a great book (at £17 for Kindle edition it should be). It's also very, very long (over 500 pages), so hats off to Mark, as typing out the above took me about 10 minutes and it's not even one page.